As you all know, I, Queen Trixie, am Empurress of Jerusalem, Israel and the Entire Middle East, Guardian of the Boudoir, Alpha Kitty Extraordinaire. 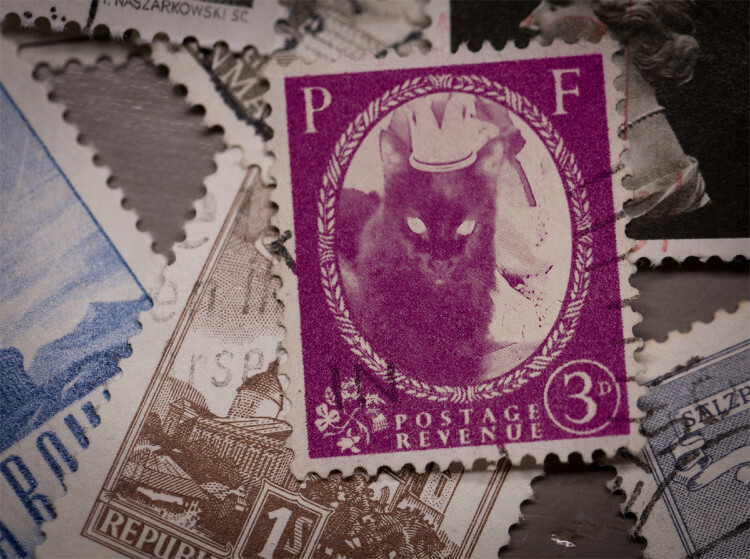 As such, it is befitting that I have My Own Purrstal Service, and it goes without saying that MY purrtrait appears on all impurrial postage stamps. This month, We are issuing a new stamp - the Threepenny Magenta, in which I appear in full impurrial regalia, wearing My Crown. 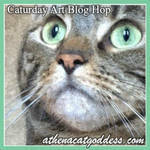 This is Our Entry in the Caturday Art blog hop hosted by Athena and her Human Marie. We used PhotoFunia to create it (Mummy's latest craze - mol). We don't remember how we added the Crown, as We did that weeks and weeks ago when expurrimenting with one of these photo-editing sites. Anyway, before We join the blog hop, We would like to wish you Shavua Tov (a Good Week), and that those of you who are suffurring arctic conditions and sub-zero tempurratures will be getting some relief from the cold. We feel so bad for all the homeless kitties and woofies and other animals and birdies who don't have warm homes to snuggle in (which reminds Mummy, it's almost time to go out and feed the homeless kitties living in Our Street, which She does effurry day, come rain or shine). Please, effurrybody, put your paws together and purray for them. May the Great Cat In The Sky grant them, too, a Good Week. Now for the bloggie hop. You look lovely on the stamp. I would buy them with your pawtrait on them. Now that is a stamp worth collecting! You look beautiful today! I would buy that stamp! That is the prettiest stamp I have ever seen. I pray every day for all kitties that live outside, so sad. How kind of your mummy to feed them. Queen Trixie, you make a wonderful postage stamp image. We have our purrs going out to all the animals who are living outdoors in the terrible arctic freezy air. oh that stamp is magnificent!! Speck-tackular stamp Queen Trixie!!! Yore simple wunderfull. Queen TRIXIE! Perfect beautiful stamp. Your Government chose well when they decided your beauty would be on the issue to dazzle all...near and far. 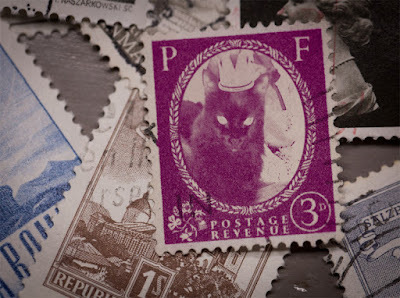 That's a beautiful stamp, befitting your stateliness and beauty, Queen Pixie! This blog was created by Possum the MagnifiCat and Princess PixieCato (a.k.a. Pixie). Pixie, alas, flew off to the Bridge on December 23, 2011 and on October 21, 2012, Possum followed her. My Mummy couldn't bear to be without kitty company and on November 12, 2012, Possum and Pixie whispered in her ear and she opened her door to Me - Trixie the Black Panther. I love Mummy very much, but I was lonesome without kitty company and on April 11, 2013, my little brofur Caspurr joined our family. Finally, on May 15, 2014, we were joined by our littlest brofur, Shimshon, aka Shimshi. He is named after Samson in the Bible. We live in Jerusalem with our Human, who has a blog of her own called "The View from the Palace" (http://shimonafromthepalace.wordpress.com/). Possum and Pixie occasionally posted articles there of importance to the Feline World, until Mummy helped them create this blog. Mummy says we will always remember Possum and Pixie. They are still here with us in spirit and always will be. But now, she says, the Torch has been passed to a New Generation. That means Us! So Hallo World - Here We are!